SUNNYVALE, Calif., Jan. 17, 2019 /PRNewswire/ -- According to the American Cancer Society, prostate cancer is the most common cancer in American men other than skin cancer. Accuray Incorporated (NASDAQ: ARAY) and The Urology Group (TUG) are partnering to recognize TUG's commitment to improving the lives of men with prostate cancer. TUG physicians recently treated the center's 1,600th prostate cancer patient using the CyberKnife® M6™ System, a groundbreaking radiotherapy device that specializes in delivering stereotactic body radiation therapy (SBRT) treatments with sub-millimeter precision. The system's unique design and advanced treatment planning software help enable physicians to avoid healthy tissue and minimize side effects on urinary, bowel, and sexual function that can reduce a man's quality of life. "For more than 20 years, The Urology Group has been dedicated to delivering quality urologic care in our community," said Gary M. Kirsh, M.D., President of The Urology Group. "We encourage men to learn about medical conditions that particularly impact them, such as prostate cancer. It's critical that men understand their risk factors for developing the disease and what a diagnosis means for them. The good news is that innovations in care, such as the CyberKnife System, have changed the way prostate cancer is managed, enabling physicians to treat the disease with unparalleled preservation of healthy tissue and provide substantial quality of life and lifestyle benefits to patients." The prostate gland can move unpredictably throughout the course of treatment, making the ability to track, detect and correct for motion critically important. In fact, the prostate has been documented to move as much as 10 mm in as little as 30 seconds due to normal patient bodily functions such as filling of the bladder, gas in the bowel or even slight patient movement during the procedure. 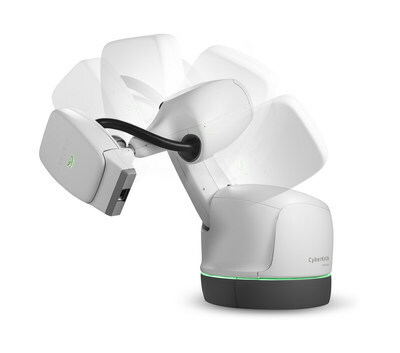 The CyberKnife System's ability to automatically stay on target despite patient and tumor motion is what differentiates it from other types of radiation therapy delivery systems. With true motion synchronization, it tracks the tumor continually throughout the treatment session so that it can more accurately deliver radiation to where the tumor is, not where it used to be. CyberKnife SBRT is completed in 4-5 sessions instead of the 30-40 sessions usually required with conventional radiation therapy to safely spare normal tissues adjacent to the prostate, and is noninvasive (no surgery involved). "A cancer diagnosis can be devastating and the journey to understand the disease and treatment options overwhelming," said Lionel Hadjadjeba, M.D., Senior Vice President and Chief Customer Experience Officer at Accuray. "We commend Dr. Kirsh and TUG team on their dedication to providing their patients with the support needed to identify the best solution for them and we are honored that the clinical team has selected the CyberKnife technology to treat so many of their prostate cancer patients. Published data continue to reinforce the benefits of CyberKnife SBRT for the treatment of low- and intermediate-risk prostate cancer. It is proven to be safe and effective, while offering a convenient, non-invasive approach that precisely targets the prostate cancer with minimal disruption to patients' daily lives." Headquartered in Cincinnati, Ohio, The Urology Group is one of the largest single specialty groups of urologists in the United States, with 39 physicians on staff. Statements made in this press release that are not statements of historical fact are forward-looking statements and are subject to the "safe harbor" provisions of the Private Securities Litigation Reform Act of 1995. Forward-looking statements in this press release relate, but are not limited, to clinical applications, clinical results, and patient experiences and outcomes. These forward-looking statements involve risks and uncertainties. If any of these risks or uncertainties materialize, or if any of the company's assumptions prove incorrect, actual results could differ materially from the results expressed or implied by these forward-looking statements. These risks and uncertainties include, but are not limited to, the company's ability to achieve widespread market acceptance of its products, the company's ability to develop new products or enhance existing products to meet customers' needs, the company's ability to maintain or increase its gross margins on product sales and services, the company's ability to meet the covenants under its credit facilities, the company's ability to convert backlog to revenue and such other risks identified under the heading "Risk Factors" in the company's annual report on Form 10-K, filed with the Securities and Exchange Commission (the "SEC") on August 24, 2018, the company's quarterly report on Form 10-Q, filed with the SEC on November 6, 2018, and as updated periodically with the company's other filings with the SEC.